Whether it’s the warm air against your face or simple childhood nostalgia, few things epitomize summer fun like a backyard tire swing. Landscape designer, Doug Scott, of Redeem Your Ground in Atlanta, Georgia, said one of the best things about a DIY tire swing is the limited number of materials needed to build one. 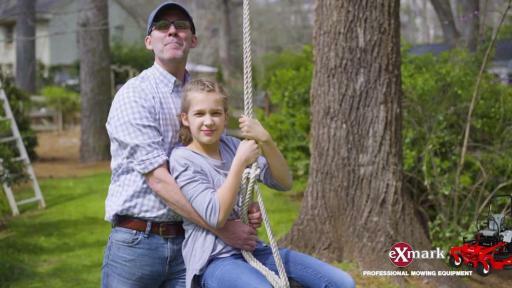 Scott has partnered with Exmark on a new ‘Done in a Weekend’ video that helps homeowners select a location and build their own backyard tree swing. Hardwood trees are optimal for tree swings, but Scott said most solid tree branches of at least six inches in diameter, roughly 7-8 feet off the ground, could safely be used. Once the tree and branch are selected, it’s important to hang the rope far enough out on the branch to minimize the potential for the swing to contact the tree trunk. Next is tire selection. While a new tire can always be used, Scott suggests repurposing a used tire for a more cost-effective option. “I’d recommend picking a used tire up from a friend or family member, or from a junk yard or garage sale. You can typically find a suitable used tire at little or no cost. Once the tire has been selected and prepped, it’s time to choose the type and length of rope for the tire swing. Choices include manila or a variety of polypropylene ropes for materials. Scott advises purchasing at least 20 feet of rope to accommodate for the desired swing height and necessary knots. In the Hanging Around video, Scott discusses the options for hanging the swing on the tree, and demonstrates all steps and processes involved in building a backyard tire swing. Visit WeAreExmark.com/DIY to view the complete Hanging Around video, as well as others in Exmark’s ‘Done in a Weekend’ series.